Shown above: 2 Manhattan Reclaimed Teak Club Chairs, 1 Manhattan Reclaimed Teak 2 Seat Sofa, 1 Blok Square Concrete Coffee Table, and 2 Tall Brooklyn Planters. If you desire modern, affluent and sensational outdoor furniture, the Manhattan Reclaimed Teak Furniture Collection with its beautiful mix of warm and stark tones will have you outdoors more often than not! 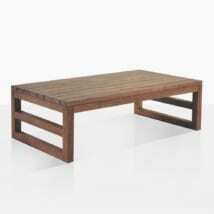 This beautiful reclaimed teak furniture set holds a contemporary vibe and yet still feels tranquil and serene. This collection comes with Dove colored cushions as shown. The minimalist nature of the Manhattan reclaimed teak furniture pieces makes this reclaimed teak suite capable of going anywhere! Imagine this set of reclaimed teak furniture in a Brooklyn apartment or the peace of a Zen garden, with a bubbling water feature and cool drink in hand to keep you calm, comfortable and chic. Try it in your great room for a splash of refinery while you enjoy easy meals, after work drinks, or even watching your favorite show! Also available in the illustrious Manhattan Reclaimed Teak Furniture Collection are two sizes of dining table, showcasing – again – the beauty of simple, masterfully made items highlighting the character of the Reclaimed Teak. Place the Manhattan Dining Table next to your Manhattan Deep Seating Reclaimed Teak Furniture Collection, surrounded by our effortlessly modern and elegant Sophia Chairs and you will have a divine furniture collection you will be proud to call your own! 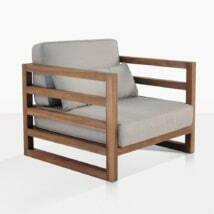 Made with Reclaimed Teak and built with outdoor hardware; Manhattan comes only with dove color Sunbrella® cushions which are free! All fully assembled in the USA. Each piece is sold separately, all in stock and ready for you to start entertaining.